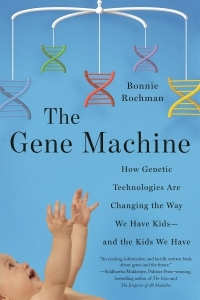 In The Gene Machine, the award-winning journalist Bonnie Rochman addresses these questions and more, guiding us through the new frontiers of gene technology and how it has forever changed medicine, bioethics, and the factors that shape a family. Rochman takes an authoritative look at the latest hot-button issues in the world of pre- and postnatal testing and tells the stories of women and men struggling to understand the variety of tests and grappling with their results—revelations that are sometimes joyous, sometimes heartbreaking, and often profound. Propelled by human narratives and meticulously reported, The Gene Machine introduces us to scientists working to unlock the secrets of the human genome; gene counselors and spiritual advisers helping parents manage this complex new reality; and, of course, parents themselves, including the author, who glimpse the genetic futures of their children. The Gene Machine is both a scientific road map and a meditation on our power to shape the future, one that gets to the very core of what it means to be human. Is DNA testing a triumph of modern medicine or a Pandora’s box of possibilities? Is screening for disease in an embryo a humane form of family planning or a slippery slope toward eugenics? And, more practically, how do we navigate the dizzying and expanding array of tests available, with more appearing every day?